Our children learn to count and recognize numbers through reading aloud and play! We read a ton of number and counting books. 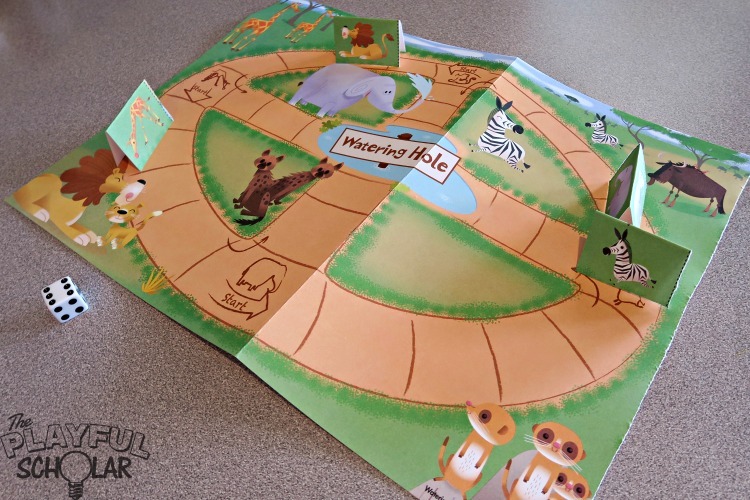 We also play math games available from our preschool program, Mother Goose Time! Here are just a couple examples of how Mother Goose Time has helped two of my little learners just this week! 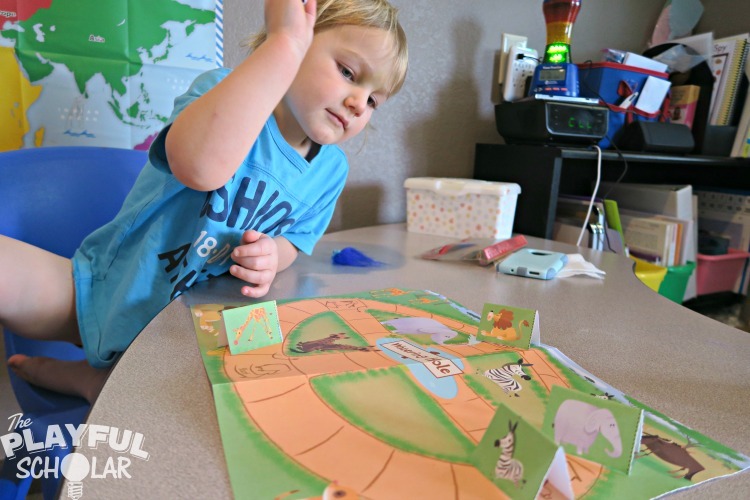 The board games that come from Mother Goose Time are fabulous! The rules are simple and the kids are focused on playing, not learning numbers. Of course learning mathematics happens too. To play this game you will need a water hole game board and dice. The object of the game is to get the animals to the watering hole. 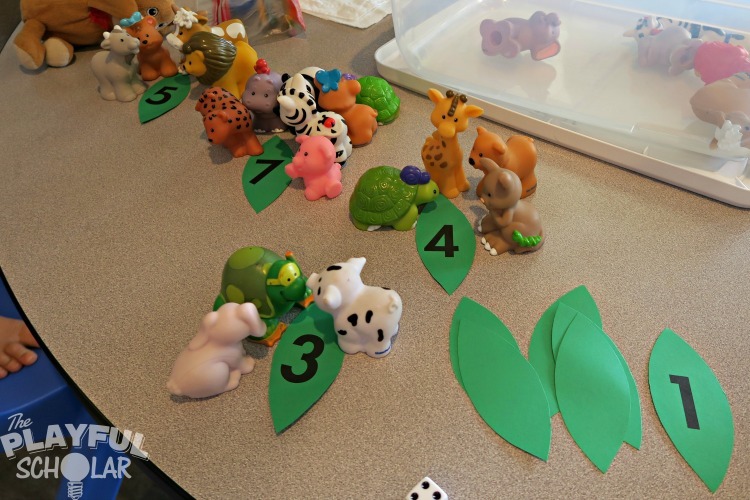 The animals are moved based on the number rolled on a dice. 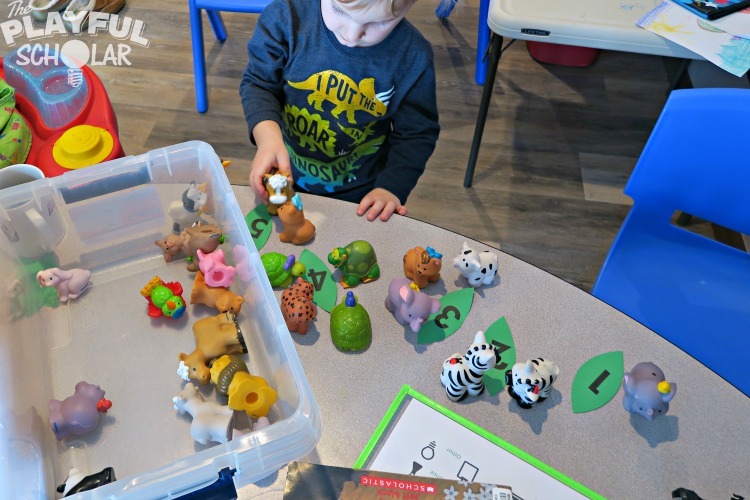 Each animal piece may be played by an individual child or one child can have the animals take turns moving towards the watering hole. This was excellent practice for rolling a dice and keeping it on the table. He tends to roll like a wild man! One of my favorite aspects of having the games arrive as part of a boxed preschool program is that I don’t sweat it when the materials get ruined. I know there are more games coming next month. I find myself much more relaxed about giving the game over to the kids to use and play with and learn from at their own pace. The kids help me cut out the board game pieces. We play with them and I leave them out to be explored by the kids. If a piece of the game (paper) goes into the mouth of a baby or the paper rips when being pulled out of a drawer it doesn’t take $20 to replace the game. These games are fun. We are playing. The learning is happening, but not at the expense of time enjoying one another. It’s a great way to learn math! Mother Goose Time provides leaves with numbers printed on them (1-10). You could make your own, but it’s hard to beat the convenience of having them arrive automatically in the company of a bunch of other awesome learning activities each month. Hide the leaves around the room or in a big pile of dirt. Have the kids pretend to be elephants rooting and digging for leaves/food. Depending on their current ability, tell them or have them tell you the number on the leaf they find. Then help them place the leaves in numerical order. You will notice that in several of these pictures not only are the leaves in order, but there are animals nibbling at the leaves. The kids love matching the number on the leaf with the same number of animals. This is a great lower pressure way for my little one to identify numbers and become more comfortable with the ones he already knows. 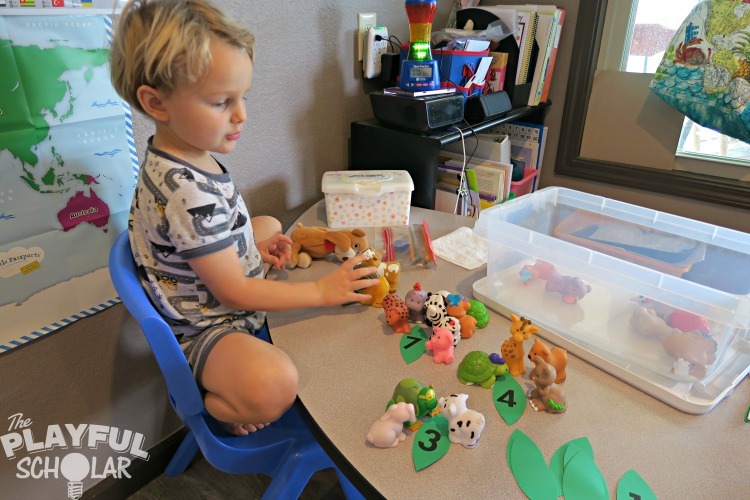 It provides practice with numerical order and since he adds in the animals it also helps him understand that the last number you say when you count is also the number of items (in this case animals). Identifying “6” versus “9” is a challenge for this kid! Since the leaves can rotate and be turned around it was a great opportunity for him to practice putting them in the correct orientation in order to recognize them. 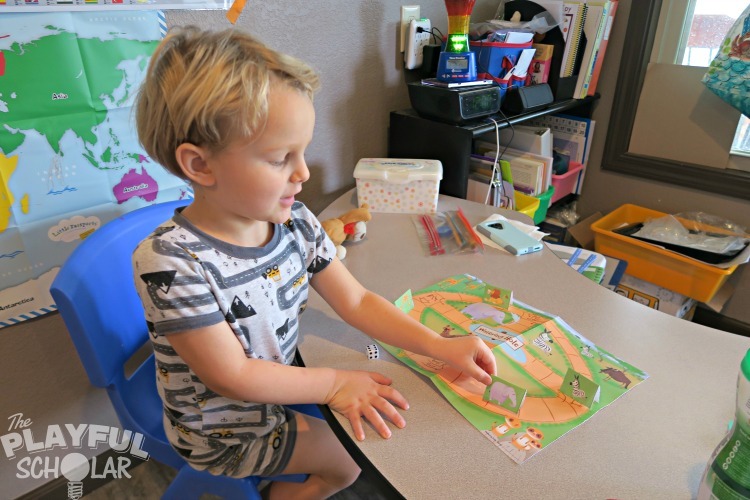 He greatly benefits from counting practice and the chance to continue to have fun with math! 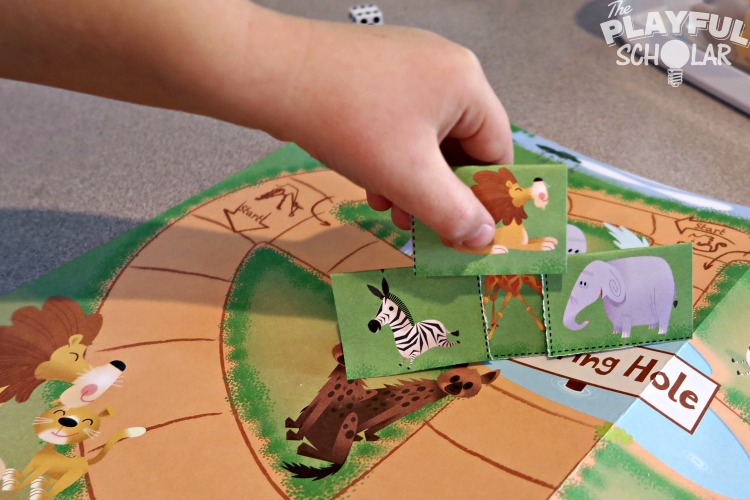 So many of the games from Mother Goose Time can be incorporated into open ended play. 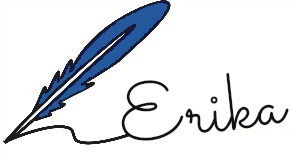 This is a fabulous example! 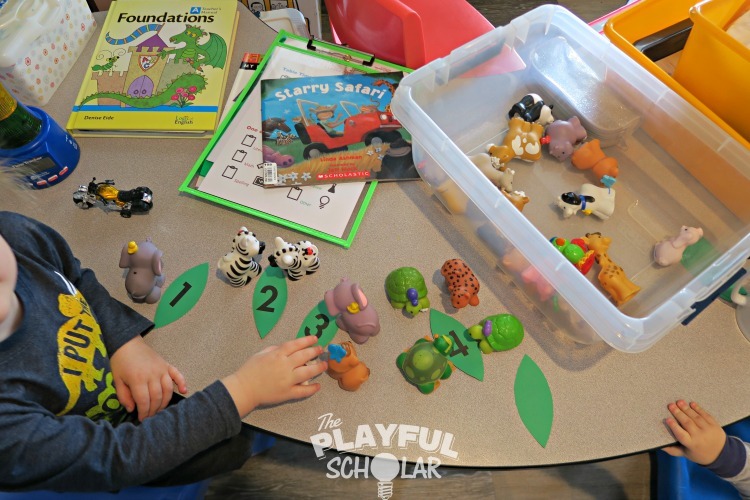 The directions for this game focus on digging up leaves like an elephant and are meant to encourage the kids to become familiar with numbers and potentially put them in numerical order. My child loves feeding the leaves to the animals. Both my Pre-K kid and my preschooler like to pretend that the leaf can feed animals in the amount listed on the leaf. For example the number “3” leaf can feed 3 animals and the number “7” leaf can feed 7 animals. You can use any animals for this activity. Since my kids came up with this idea themselves there was no effort from my part in getting them engaged. I simply faciliated their learning by answering questions and gently correcting if I saw them pick the wrong number of animals for a leaf. Mother Goose Time works because it is fun. Nothing beats learning through play especially surrounded by those you love!